Will my Thai marriage be recognised in my own country? Please check with the embassy of your own country but for the UK, if you have legalised your marriage under Thai law then the marriage will be automatically recognised under UK law. The Thai marriage certificate will be in Thai only but you can get a “sworn translation” from a translation agency so that you can use the document for legal purposes in the UK. 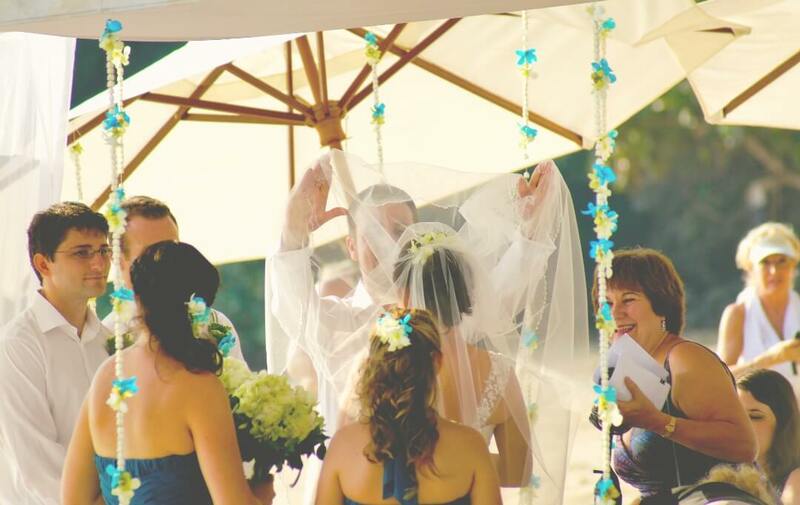 The consular section of your embassy in Bangkok can arrange for your marriage to be recorded in the UK. This is not a legal requirement but can be handy if you lose your certificate. 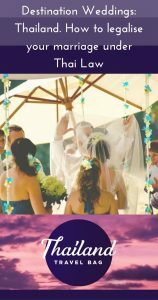 Here are the 4 steps explained in more detail if you want to get officially married in Thailand. Thai authorities require every foreign national wishing to marry in Thailand to obtain an ‘Affirmation of Freedom to Marry.’ This cannot be obtained in your home country so you will need to apply to your country’s embassy in Bangkok. The affirmation is a form that confirms that you are legally free to marry and has to be signed by you in the presence of a consular official. The procedure is that after you have signed the document at the embassy, you return the next day to collect it and by this time it will have been countersigned by an official from the embassy. Your embassy will charge you for this service and they will need your passport and evidence of termination of any previous marriages too. (divorce certificate or death certificate). Make sure you take original documents and not photocopies. Once you have obtained the ‘Affirmation of Freedom to Marry’, the form needs to be translated into Thai and there are many translation services near all the embassies which is helpful. Now that you have the ‘Affirmation to Marry’ and the Thai translation, submit these forms to the Ministry of Foreign Affairs in Bangkok. The ministry authenticates the forms and returns them to you the following day. Don’t miss this step out as it is the only way to legalise your marriage under Thai Law. Note that this office will be very busy since all nationalities will need to get a signature here. 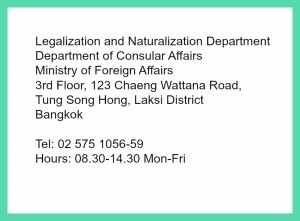 A fee is payable for this service and if you are not in a hurry and don’t want to hang around Bangkok, you can submit the forms to the Ministry of Foreign Affairs by post. Many translation agencies can help with this. Once you have all the above paperwork, visit any district (amphur) office which is similar to a town hall. This can be done anywhere in Thailand, not just in Bangkok. For the marriage to be valid under Thai law it must be registered at the amphur office so you are officially married on the day that you register at the this office. Don’t forget all your documents including translations and your passport. There is not usually any need to make an appointment, but go with somebody who can speak Thai. You have 3 months to do this after the first 3 steps have been done, after which the documents are no longer valid. 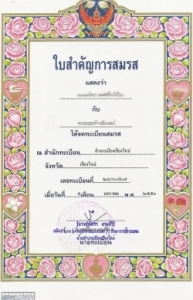 If you have a Thai partner they must submit their Identification Card and their House Registration Certificate in order to legalise your marriage under Thai law. Once the marriage registration is completed, you and your husband or wife will both be given a copy of the Marriage Registration Certificate. And that is it you are married and your marriage is instantly recognised practically anywhere in the world! 1. Here is a document which outlines all of the above by the British Embassy along with their suggested format for the Affirmation to Marry document. 4. Getting married officially in your own country BEFORE/AFTER coming to doing a blessing style wedding in Thailand means that none of the above has to be done.